For the drivers in West Valley, Murray City, Orem, and the surrounding Utah communities, there’s only one car that sits at the crossroads of timeless style and high-tech wonder—the 2018 Volkswagen Beetle.If that sounds like something that might interest you, we encourage you to reach out to us immediately! Just call us, text us, chat with us on our website, or stop by our showroom at Volkswagen SouthTowne. We’ll have you behind the wheel of the 2018 Volkswagen Beetle for a test drive in practically no time. Design is paramount inside the 2018 VW Beetle—and outside of it, too. Inside the cabin, you’ll love life with the exciting retro-modern gauges, a Käferfach heritage-inspired glovebox, a leather-wrapped, multi-function steering wheel, V-Tex leatherette seating surfaces, and even customizable interior ambient lighting. On the exterior, you (and anyone else who has the pleasure of catching a glimpse of the car) will love life with its iconic Beetle frame, available Bi-Xenon headlights, sport-style front and rear bumpers, and even the choice between 17” and 18” alloy wheels, which both feature the unmistakable VW center symbol. But, of course, the inside and the outside must meet at some point. In the 2018 Volkswagen Beetle, that meeting point is the power tilting and sliding panoramic sunroof, where the fresh air meets your cabin. Yet that’s not all. A host of state-of-the-art entertainment tech will keep the entire crew’s attention. And, in addition to its entertainment value, that same technological prowess is on your team in terms of safety and convenience: from the Rearview Camera System to the Blind Spot Monitor and beyond. Last, but certainly not least, if fuel economy ratings are something that are frequently on your mind, you can rest assured… They’re something that are frequently on the minds of the Volkswagen engineers, too. 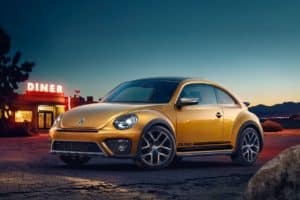 They applied their brilliant minds to the problem and came up with a marvelous solution—the 2018 VW Beetle is capable of achieving up to 26 city/33 highway MPG1. And that’s all while delivering as much as 174 horsepower and 184 lb-ft of torque. 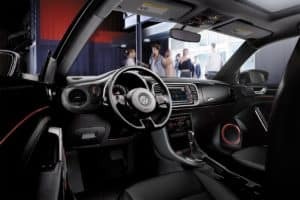 Schedule your exclusive test drive today at Volkswagen SouthTowne! So… What do you say? Are you ready to experience the magnificent 2018 Volkswagen Beetle for yourself? If you are, then please contact us soon at Volkswagen SouthTowne. We’ll set you up with your test drive and much more. Drivers in Orem, Murray City, and West Valley, stop by our showroom today. Otherwise, please call us on the phone, chat with us on our website, or text us from your cell phone. Contact us today! 126 city/33 highway MPG (2018 Beetle 2.0L, 6-speed automatic transmission). EPA estimates. Your mileage will vary and depends on several factors, including your driving habits and vehicle condition.